The core component of the PAM framework are the authentication library API (the front end) and the authentication mechanism-specific modules (the back end), connected through the Service Provider Interface. Applications write to the PAM API, while the authentication-system providers write to PAM API and supply the back end module that are independent of the applications. When an application makes a call to the PAM API, it loads the appropriate authentication module as determined by the configuration file, `pam.conf’. The request is forwarded to the underlying authentication module (for example, UNIX password, Kerberos, smart cards) to perform the specified operation. 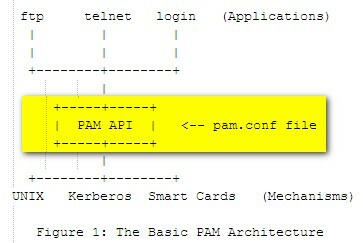 The PAM layer then returns the response from the authentication module to the application. Not all applications or services may need all of the above components, and not each authentication module may need to provide support for all of the interfaces. account :::::: This set includes the `pam_acct_mgmt()’ function to check whether the authenticated user should be given access to his/her account. This function can implement account expiration and access hour restrictions. password :::::: This set includes a function, `pam_chauthtok()’, to change the password. Daemon: On Unix or other computer multitasking operating program, a daemon is a computer program that runs in the background. In Unix environment, the parent process of Daemon is often init process(PID=1). Process usually become daemon by forking a child and exit the parents immediately, thus cause init to adopt the child process. Zombie: On Unix and Unix-like computer OS, a zombie process is a process that completed execution but still has an entry in the process table. This entry is still needed to allow the process that started the process to read its exit status. Unlike normal process, the kill() call has no effect on a zombie process. When a process ends, all the memory and resources are deallocated so they can be used by other process. However, the process’s entry in the process table remains. The parent can read the child’s exit status by wait() system calls, at which stage the zombie are removed. A zombie process is not the same as an orphan process. An orphan process is a process that is still executing, but whose parent has died. They do not become zombie processes; instead, they are adopted by init(PID 1), which wait() on its children. One of the first issues that you’ll encounter when developing your Windows Sockets applications is the difference between blocking and non-blocking sockets. Whenever you perform some operation on a socket, it may not be able to complete immediately and return control back to your program. For example, a read on a socket cannot complete until some data has been sent by the remote host. If there is no data waiting to be read, one of two things can happen: the function can wait until some data has been written on the socket, or it can return immediately with an error that indicates that there is no data to be read. The first case is called a blocking socket. In other words, the program is “blocked” until the request for data has been satisfied. When the remote system does write some data on the socket, the read operation will complete and execution of the program will resume. The second case is called a non-blocking socket, and requires that the application recognize the error condition and handle the situation appropriately. Programs that use non-blocking sockets typically use one of two methods when sending and receiving data. The first method, called polling, is when the program periodically attempts to read or write data from the socket (typically using a timer). The second, and preferred method, is to use what is called asynchronous notification. This means that the program is notified whenever a socket event takes place, and in turn can respond to that event. For example, if the remote program writes some data to the socket, a “read event” is generated so that program knows it can read the data from the socket at that point. For historical reasons, the default behavior is for socket functions to “block” and not return until the operation has completed. However, blocking sockets in Windows can introduce some special problems. For 16-bit applications, the blocking function will enter what is called a “message loop” where it continues to process messages sent to it by Windows and other applications. Since messages are being processed, this means that the program can be re-entered at a different point with the blocked operation parked on the program’s stack. For example, consider a program that attempts to read some data from the socket when a button is pressed. Because no data has been written yet, it blocks and the program goes into a message loop. The user then presses a different button, which causes code to be executed, which in turn attempts to read data from the socket, and so on. Blocking socket functions can introduce a different type of problem in 32-bit applications because blocking functions will prevent the calling thread from processing any messages sent to it. Since many applications are single-threaded, this can result in the application being unresponsive to user actions. To resolve the general problems with blocking sockets, the Windows Sockets standard states that there may only be one outstanding blocked call per thread of execution. This means that 16-bit applications that are re-entered (as in the example above) will encounter errors whenever they try to take some action while a blocking function is already in progress. With 32-bit programs, the creation of worker threads to perform blocking socket operations is a common approach, although it introduces additional complexity into the application. Use a blocking (synchronous) socket. In this mode, the program will not resume execution until the socket operation has completed. Blocking sockets in 16-bit application will allow it to be re-entered at a different point, and 32-bit applications will stop responding to user actions. This can lead to complex interactions (and difficult debugging) if there are multiple active controls in use by the application. Use a non-blocking (asynchronous) socket, which allows your application to respond to events. For example, when the remote system writes data to the socket, a Read event is generated for the control. Your application can respond by reading the data from the socket, and perhaps send some data back, depending on the context of the data received. If you decide to use non-blocking sockets in your application, it’s important to keep in mind that you must check the return value from every read and write operation, since it is possible that you may not be able to send or receive all of the specified data. Frequently, developers encounter problems when they write a program that assumes a given number of bytes can always be written to, or read from, the socket. In many cases, the program works as expected when developed and tested on a local area network, but fails unpredictably when the program is released to a user that has a slower network connection (such as a serial dial-up connection to the Internet). By always checking the return values of these operations, you insure that your program will work correctly, regardless of the speed or configuration of the network. A daemon is a background process designed to run autonomously with little or no user intervention. getty – set terminal type, modes, speed, and line discipline. getty is invoked by init, as the second process in the series, init > getty > login > shell, that ultimately connects a user with the HPUX system.Getty sets the terminal speed and characteristics and prompts for the users’ login information before passing control to the login program. When boot init receives a child death signal telling it that a process it spawned has died, it records the fact and the reason it died in the utmps database, /etc/utmp, /var/adm/wtmps. when one the above conditions happen, boot init re-examine the /etc/inittab. New items can be added to the inittab file at any time.